In the previous articles we’ve discussed how big of a role have walls in the living room in terms of deciding the main theme, style and energy that will be dominant in the place. If you are bored with plain painted walls and you want to attain a more unique and artistic appearance to your living room, then you are in luck today. The wallpapers are the ultimate choice for providing the living room with decorative and light element and creating a more artistic and interesting ambiance in the place. The wallpapers also are flexible and you can change them when you get bored with the current ones. Different patterns and colors of the wallpaper can provide specific style and identity to the living space. We are going to present you a showcase of 20 amazing living room wallpaper design ideas which could serve as an inspiration for your living room. Enjoy! The deep teal color in combination with the perky floral pattern gives a sensual and fresh touch to this light and modern living room. The thick pattern in combination with the rich color provides a profound and distinctive feel in this living room. This is a great choice to provide your living room with ecstatic and lively appearance. The pale blue color combination with the ivory damask pattern brings a sensuality and gentle touch in this country inspired living room. The light and romantic nature of this wallpaper provides this living room with airy, light and vintage appeal. The floral pattern with yellow accent on a plain white foundation of this lovely wallpaper may be the right element to provide your living room with the perks of a light and upbeat living room. The floral wallpaper with subtle elegance is providing this living room with a bright and sunny note. This is really sunny and beautiful wallpaper which may open up your living room and provide it with a bright and ecstatic accent. The bright, lively nature of this pastel yellow wallpaper breaks through the plain appearance of this living room and provides it with interesting and charming appeal. The creative pattern in combination with the realistic 3d design of this wallpaper may work for providing your living room with creative and modern note. The dark color of the wallpaper brings a serious and formal note and the suitcase pattern soothes up the ambiance and add a fun and creative appearance in this living room. There is no doubt that this wallpaper is the main energy source of this living room. The vibrant pattern and cool aqua colors are the essence of the radiant and refreshing ambiance that prevails in this living room. The ivory damask wallpaper is a perfect element for every living room that wants to attain an elegant and french inspired character. The elegant and graceful design of this living room provides the place with nice and sumtumous attitude. 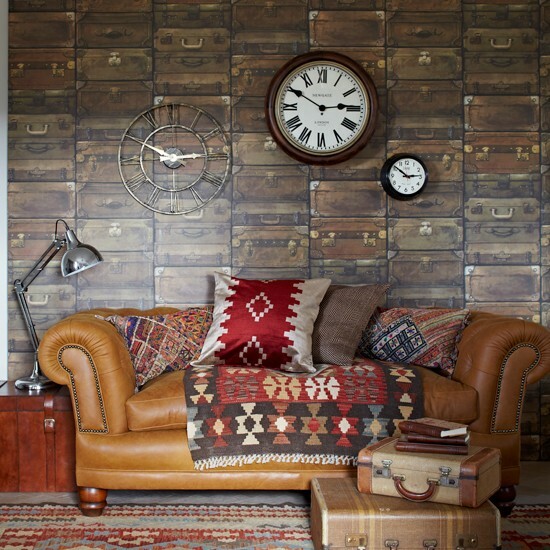 This monochromatic wallpaper works in a this country inspired living room and adds to the beauty of the same. The subtle design and pale blue color of this wallpaper are providing this living room with cool and modern ambiance. Nature inspired wallpaper is perfect for Eco inspired living room theme. The fresh and cool appearance of this living room is due to the refreshing white and green nature patterned wallpaper. The lilac purple color is the sweet essence of this ivory and feminine living room. The damask pattern provides the place with traditional and elegant appearance and the purple color brings the sensual and the chic element in the same. 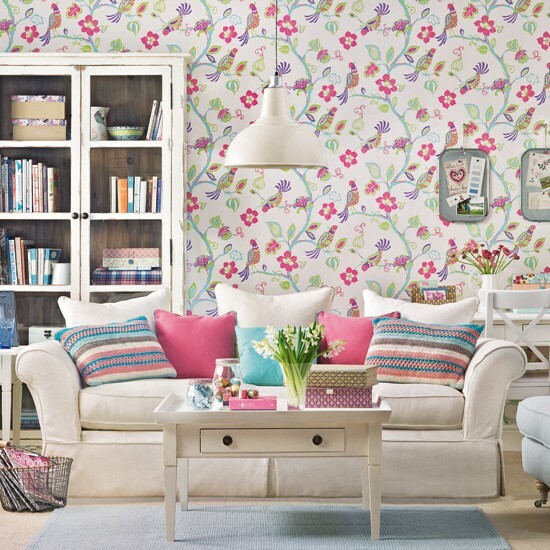 Imagine how will this living room look like without this perky wallpaper, it will look dull, that is sure. This lively and creative wallpaper is the essence of the cheerful and amazing ambiance in this light living room with country appeal. This is really daring and dramatic setting of a living room, due to the various patterns of the wallpaper. The striped statement wallpaper is the focal point and provide the living room with a modern vibe and the floral traditional wallpaper adds an elegant and perky appearance to the place. This is the easiest way to change the concept of a plain dull living room to a super creative and modern living room. This wallpaper with a cherry tree adds a note from the Eastern culture and yet provides this place with elegant and sophisticated ambiance. The warm colors of this floral patterned wallpaper in combination with the black background adds a super chic and modern appearance in this living room. Dark colored wallpapers are great for providing the living room with contemporary and more mature appearance. The creamy tones in combination with the geometrical pattern provides this living room with balanced and relaxed ambiance. Wallpaper like this is perfect for simple and the natural appearance of the living room. The monochromatic nature of this tree inspired wallpaper goes perfectly with the rustic setting in this living room. The subtle elegance of this wallpaper provides this room with authentic and charming appeal. If you want to attain vibrant and contemporary ambiance in your living room then you should go for a wallpaper like this one. The geometrical pattern in combination with the light colors creates a super cheerful and modern appearance of the living room. The deep blue wallpaper adds a soul in this living room. The ecstatic and vibrant ambiance is due to the unique and the indigo blue color of this amazing wallpaper. The deep color in combination with the vintage floral pattern adds a really distinctive and elegant appearance in this living room. 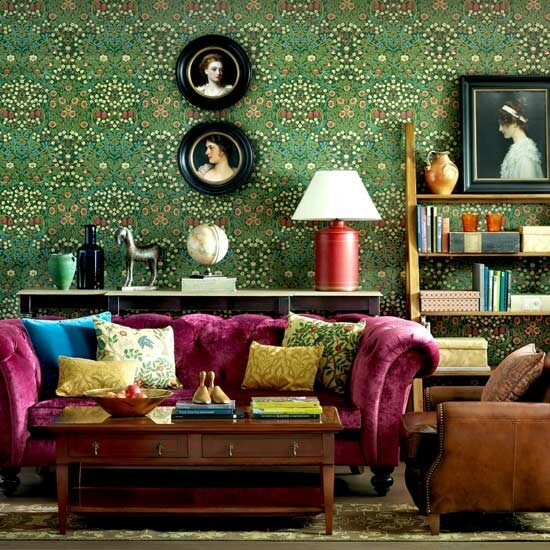 This is a perfect wallpaper for creating a royalty vintage living room. 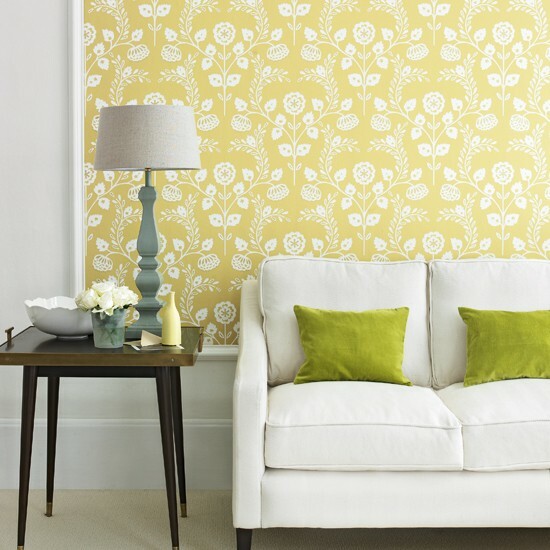 This is a really simple and yet beautiful wallpaper which may add fun and modern appearance in the living room. 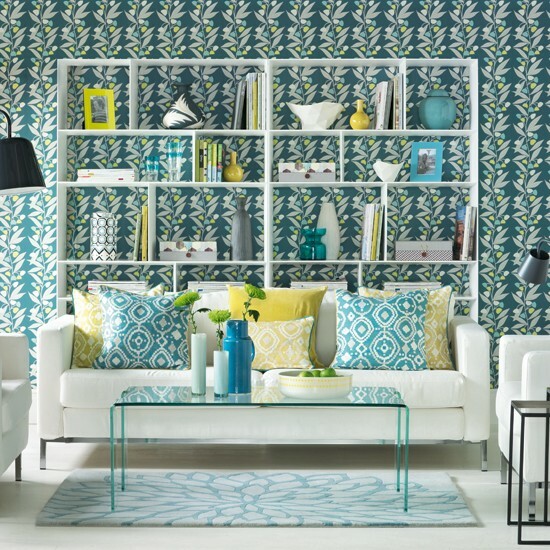 Which of these amazing wallpapers will be the right fit for your living room? See more living room design ideas on 20 Amazing Living Room Furniture Arrangment Ideas.